MASSACHUSETTS could be at the forefront of ocean management reform in the United States if a bill now moving through the state’s legislature passes into law. 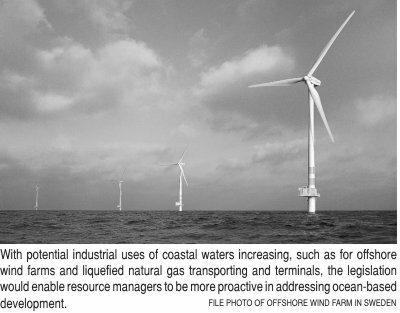 With potential industrial uses of coastal waters increasing - such as for offshore wind farms, liquefied natural gas terminals, floating electric generating stations, drilling and mining - the legislation would enable resource managers to be more proactive in addressing ocean-based development proposals and activities within the state’s waters and in fostering the sustainable use of natural resources. It would also mark a shift toward ecosystem-based management of ocean resources, which takes into account the interdependence of ecosystems and provides for smooth governance across jurisdictional boundaries. The bill calls for the creation of an Ocean Management Plan that would be overseen by the secretary of the state’s Executive Office of Environmental Affairs and would address activities that occur in waters up to three miles offshore and, to some extent, could influence activities that occur in adjacent waters. Having a management plan will help the state to anticipate and guide development on the Commonwealth’s waters, according to Susan Snow-Cotter, director of the Massachusetts Office of Coastal Zone Management (CZM). Whereas the current response to development proposals from regulatory and permitting agencies is ad hoc, the new approach would require any industrial development or activities to conform upfront to the plan, which would define areas of the sea for various uses and for protection. The existing regulatory framework would remain, according to Snow-Cotter, but there would be clearer direction and better coordination among agencies and across jurisdictional lines, with agencies reaching agreements about appropriate development even before applications are submitted. “The state needs to do a better job of dealing with the growing pressures presented by development in the ocean and needs to do it in an informed, comprehensive way,” said Robert O’Leary, Massachusetts state senator for Cape Cod and the Islands and sponsor of the bill, which also has the support of Governor Mitt Romney. This legislation will enable “more aggressive planning around ocean issues,” O’Leary said. Added Priscilla Brooks, a senior economist at the Conservation Law Foundation (CLF) and director of CLF’s Marine Conservation program, “With this bill, Massachusetts can get ahead of the rising tide of ocean development through comprehensive ocean management that promotes sustainable uses while protecting our public trust ocean resources.” CLF, Mass Audubon, and the Ocean Conservancy support the bill. The plan would be re-evaluated every five years with public participation and modified as more is learned about the ocean environment. A scientific baseline assessment of the state’s ocean resources, including identification of important and sensitive habitats, would be conducted and that information used in the state’s decision-making. By planning before permitting, the bill’s authors hope that one of the results would be to head off the disputes that arise between developers and communities affected by projects on the sea. The legislation stemmed from the recommendations of the Massachusetts Ocean Management Task Force - a group comprised of government officials, and representatives from environmental groups, fishing associations and academia - that studied ways to improve the state’s stewardship and management of ocean resources. The legislation also falls in line with the recommendations of the Pew Oceans Commission and the United States Commission on Ocean Policy. Both bodies advised that the nation begin moving toward a national ocean policy that incorporates ecosystem-based governance of ocean resources. Few models of this type of governance exist, which poses a challenge for planners. Those behind the bill have been learning from a federally-led effort in Canada known as the Eastern Scotian Shelf Integrated Management Initiative, which will manage activities in the ocean area from Halifax to the Laurentian Channel, and from planning efforts in Australia and New Zealand, according to CZM’s Snow-Cotter. If the bill passes, it could become law by this summer.